The Fitzroy-ACU Women 1 team will play in the Preliminary Final against Marcellin this weekend after going down to a slick, fast and hard St Kevin’s Saints on Saturday at East Malvern. 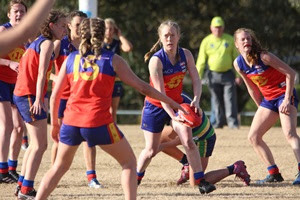 The Roy Girls are pretty clear on the standard that will be required to take on the best in the grand final – should they make it through this week – after St Kevin’s set the tone early in the second semi-final and were never headed. The final score was St Kevin’s 6.10.46 to Fitzroy-ACU 1.0.6. Lauren Carlin kicked the goal in the first quarter from a great link-up passage of play down the wing. Best on the day were Lauren Atkinson, Alexa Madden, Gemma Minuz, Tash Ross-Harris, who gained a lot of mileage from the ruck contests, and Emily Fitt. The team will be disappointed that they didn’t quite bring their A game, but their effort and energy could not have been faulted as they met SKOB’s physical pressure head on. A large contingent of the Women 2 team and other Fitzroy faithful were out in force to cheer the Roy Girls on. This weekend they play the Preliminary Final on Sunday 13 August at 2pm at Trevor Barker Oval in Sandringham. Let’s get behind the girls and see if they can make it to the big dance for another chance to meet SKOB Saints. The VAFA finals entry price is $10 for adults and $5 concession. Please note there is a strict no dogs policy at Trevor Barker Oval. And, congratulations to Fitzroy-ACU Women 2 players Siobhan Williams (4 votes), Madeline Hogan, Bridie Murphhy and Georgina Steggall (3 votes), Lola Button and Dana Louey (2 votes) and Anthea Clarke, Emilie Goegan and Alice Batterton (1 vote each) who were awarded umpire votes during the Division 4 season and mentioned during the count this week. The full count for Development Division 4 is here. The VAFA Premier Women’s best and fairest will be held on Monday night with a number of players expected to do well. Keep an eye and ear out for more on that. Fitzroy Seniors take on Old Carey at Brunswick Street Oval in a game they really have to win tomorrow. Fitzroy sits second from the bottom of the Premier B ladder and has four games to secure their spot in Premier B for 2018. Old Carey has plenty to play for too, currently sitting just one game out of the four. 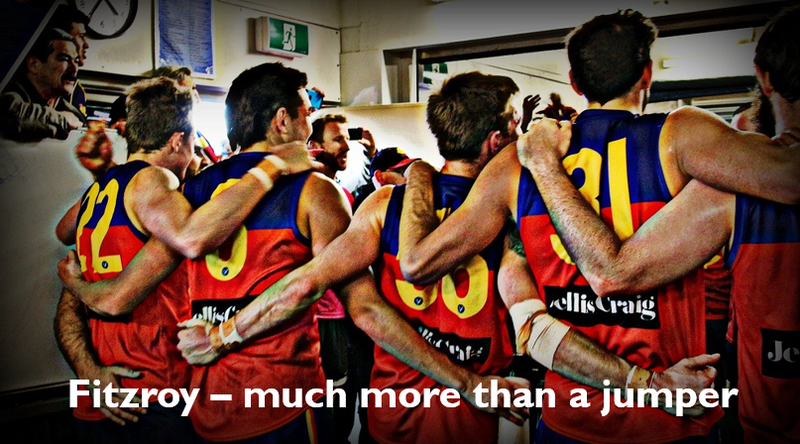 Fitzroy defeated Old Carey in Round 8 at their home ground – in fact it was the last game Fitzroy won. After a bye, there should be fresh legs and maybe some players returning from injury. Get on down to Brunswick Street Oval if you can and cheer the boys on. 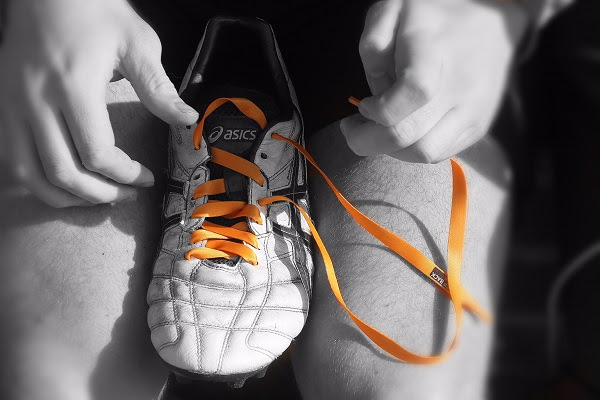 Fitzroy will join 150 grass roots footy clubs around Australia tomorrow donning the orange laces to make a stand against social violence as part of Step Back Think’s dedicated Lace Up Week campaign from August 7-13. The clubs will swap their traditional laces for orange ones, to raise awareness about social violence, which includes one-punch assaults, pub brawls and street fights. Three lucky winners will be very happy after their names are drawn out in Fitzroy’s Major Raffle tomorrow. Could your name be on that ticket for the $3000 travel prize or tickets to the 2017 Toyota AFL Finals Series, including the 2017 Toyota AFL Grand Final (AFL authorised GF promotion GFAFL17/49)? Join the members, friends and teams in the post-match celebrations at the Community Rooms at Brunswick Street Oval on Saturday night after Fitzroy takes on Old Carey, and witness the raffle draw at 6pm. Any last-minute ticket purchases can be made at BSO tomorrow. A huge thank you to our raffle sponsors, the Brisbane Lions and Caltex. A raft of Fitzroy sponsors, business members and community organisations gathered at the Royal Derby on Wednesday night for Fitzroy’s first business and community networking night. The club took the opportunity to thank our 2017 sponsors and provide an update on some of the on and off field action at Fitzroy FC, from President Joan Eddy, Senior Coach Nick Mitchell and Director Kevin Sharp. Thank you to major sponsors, The Royal Derby, for hosting the event. 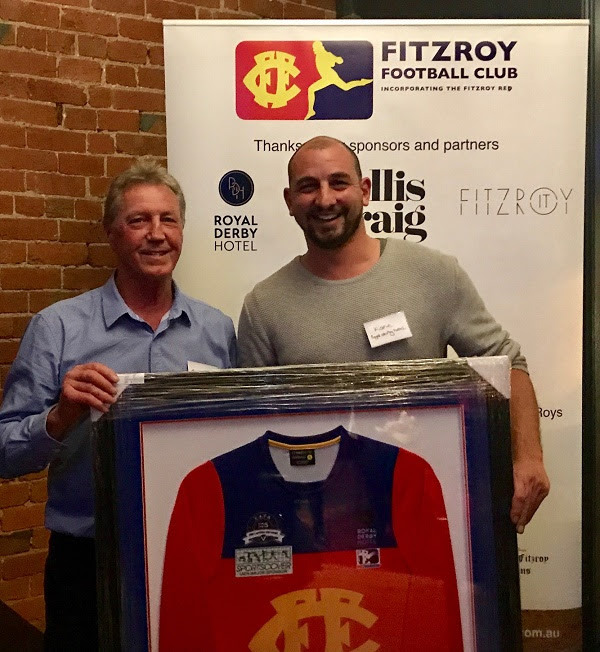 Director Kane Tancredi, a big Fitzroy and Lions man, accepted his newest framed Fitzroy jumper from Sponsorship Director, Grant Hammond, as part of the pub’s three-year sponsorship package. Rob Elsom and his team from Jellis Craig and Justin Kelly from FitzroyIT, joined Helen Seniga from das pilates, and the team from Clifroy Community Bank Branch of the Bendigo Bank, including new Bank Manager, Kim Dower, Chair Jenny Farrer and Community Engagement Manager, Michael Galante. The other large contingent was from the Reds Foundation, including those with sponsorship or business arrangements with the club also, such as Craig Walden from APS Benefits Group and Mike Wallis from Aspect Underwriting. It was terrific to see a number of former Reds players continuing to take a keen interest in the club’s development. Community representatives included Chair of Fitzroy Rotary, Joy Millen, CEO of the Fitzroy Learning Network, Jemal Ahmed and Executive Officer of the Inner North Foundation, Ben Rogers. If you are interested in being involved with the next business and community networking night, please contact Kevin Sharp. Fitzroy’s Thirds took it right to Ajax on a wet and windy BSO last Sunday morning, but didn’t quite have the legs in the final quarter. Ajax ran out winners 12.8.80 to 9.1.55. Fitzroy’s accuracy was outstanding given the conditions. Fitzroy’s best were Simon Heather (with three goals), Liam Webb, James Pitts, Jacob Peggie and Lachie Henderson, adding a dash of class. The team now holds onto fourth spot on the ladder just on percentage, as Monash Blues (equal on points) also won over the weekend. 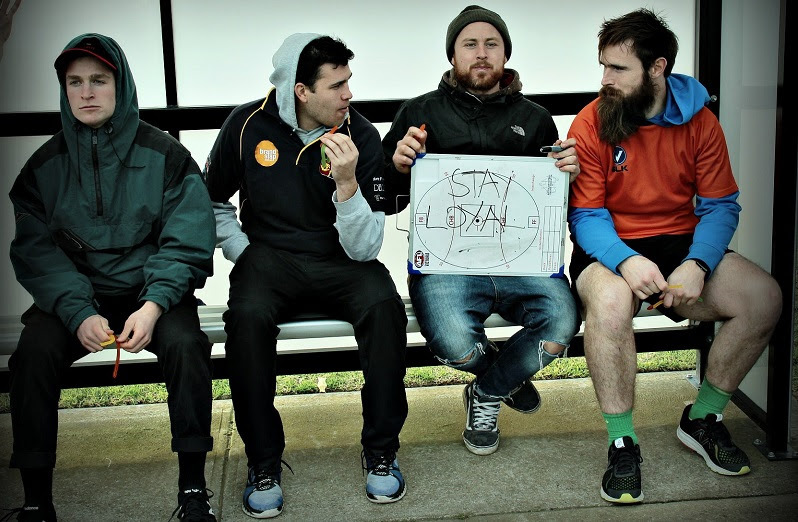 The equation is pretty simple for Fitzroy this weekend - win against bottom side Old Carey Grammarians and they are into the semis. Go Roys! Congratulations to Nathan White – an escapee from the 70s – who played his 50th game for Fitzroy and was acknowledge after the game by his coach and teammates. There have been some promising signs coming from the Under 19 sides in the last few weeks and with the inclusion of a number of players with senior experience, Fitzroy knocked off the top side, Collegians. With a Senior bye in the VAFA last week, Tim Bell’s Under 19(1) side scored a convincing win over Collegians, 11.13.79 to 5.9.39, sending them back to second spot. Nino Lazzaro continued with his senior level form and was best player for Fitzroy, also scoring two goals. Rory Patterson kicked three and Will Symons two. Noah Wright and Ted Clayton also excelled. 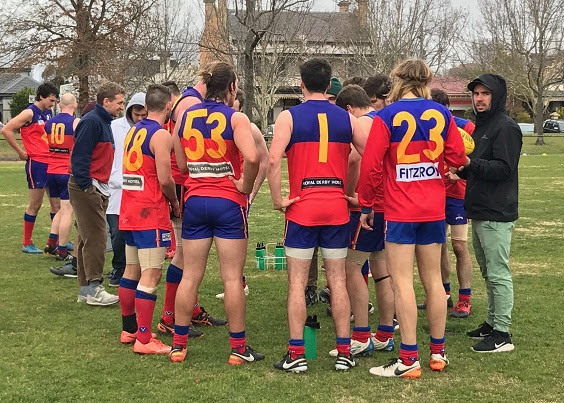 After a good first quarter against Peninsula Old Boys, Fitzroy’s Under 19(2) team had a second quarter lapse which really cost them the game, as Peninsula scored five goals to one. In the end Fitzroy went down by 19 points, 12.11.83 to 9.10.64. Jacob Long also enjoyed his day back with the Under 19s, kicking three goals, while team mate Rhys Dolby also kicked three. Dolby, Eddie Gosling and Matt Lynas were the best players for Fitzroy. The Under 19(2) team will be bolstered by a number of the Fitzroy Junior Footy Club’s Colts team members, who have finished their season and will now step up to the VAFA comp for the remaining rounds. If you think playing 100 games is quite an achievement, imagine umpiring 500! Well that is what David Hindle will do when he umpires Fitzroy’s game against Old Carey on Saturday. David told club President Joan Eddy he wanted to do the game at Brunswick Street Oval because of the history and culture at Fitzroy. “We are so well looked after, before, during and after the game, regardless of a match result,” David said. David started umpiring as a field umpire in 1969 and retired in 1983. In 2007 he returned to the VAFA as a goal umpire and will have that role in tomorrow's game. David will lead the other umpires out onto the ground at the start of the game as a recognition of his milestone. Let’s acknowledge such an incredible feat. 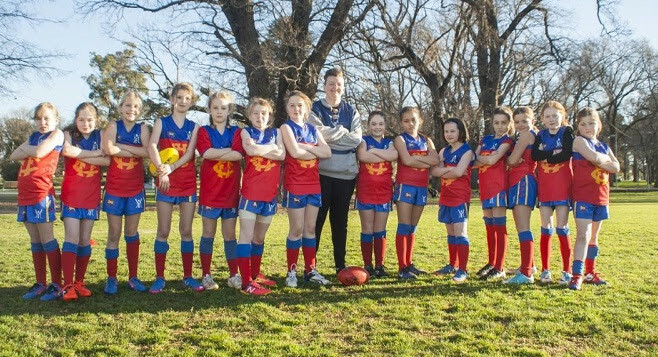 Fitzroy-ACU Women 2 player, Frankie Freeman, has not only been honing her own craft during the season, but one of the inaugural Roy Girls, has been passing on her wisdom and intel to the younger generation, coaching a Fitzroy Junior Football Club Under 10s team. She tells the Red Roy about her first year of coaching the juniors, demonstrating a lovely connection between Roy Girls big and small. Go Frankie! Tell us how you got started coaching the juniors? “A combination of a couple of beers and a lot of enthusiasm! I kinda got (willingly) roped into it after having a yarn to Phil Murdoch (FJFC President) at the Fitzroy Season launch earlier this year. “But it's been something I've been thinking about for a while. It's not quite my first foray into football coaching - I was the playing coach for my inter-school sports team in high school because none of the teachers wanted to put their hand up to coach a girls’ team…which says a lot about where women's AFL was at when I was younger! What's next in your coaching career? “I'm super keen to build on this year and become a better coach going into the future. I'm particularly interested in the development of women's and girl's footy and think that's where my coaching career will be based - I'm doing some training over the summer to make sure that I'm prepared for an even better season next year.